An increasingly influential German cardinal spoke to a packed auditorium at Stanford University on Jan. 15 about the challenge of organizing a free and open society that is linked with the common good. In the lecture, titled “The Contribution of Christian Values to the Common Good,” Cardinal Marx referred to his early formation into the “left position” of social justice—“how to work with those who are poor,” he said—through conversations with his father. In identifying a couple of the main challenges in the Western world today, Cardinal Marx said, “We must think beyond capitalism. We have to create a model nearer to the social market economy.” This economic model includes strong social protections for vulnerable members of society. 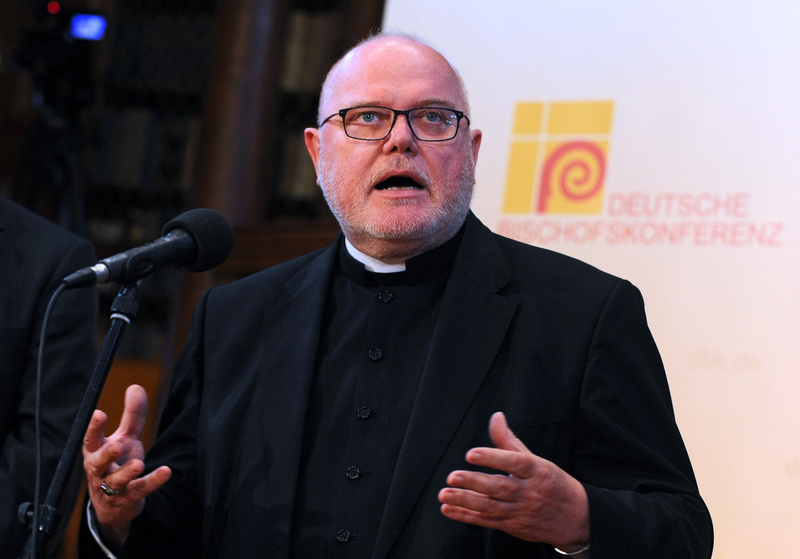 Cardinal Marx, 61, the archbishop of Munich and Freising, coordinates the Vatican Council for the Economy, leads a commission of Catholic bishops in Europe that examines E.U. policy from a Catholic perspective, and is the author of Das Kapital: A Plea for Man (2008). He is the first cardinal to be invited by the Stanford University Office of Religious Life to deliver the annual Roger W. Heyns Lecture. Several people were turned away due to limited space, but a video of the lecture will be posted online. The cardinal also spoke about the importance of human rights in the pursuit of the common good. “Human rights are not the property of Parliament,” he said. A challenge of modern society, he said, is “how to define points that cannot be decided by the Parliament.” This discussion, he explained, must happen on a global level. Later in the lecture he gave several examples of problems that affect the whole world, like climate change and the financial crisis. “Perhaps the most important discussion of the 21st century is how to organize the common good on a global level, to protect human rights for all people,” he said. Cardinal Marx also offered a portrait of the way business is changing in some of the offices of the Roman Curia. In the past, he explained, when the Vatican confronted economic questions the cardinals would sit on one side of the room, and the lay experts on the other. Now for the first time, he explained, we arrange ourselves around the table, “cardinal, lay, cardinal, lay,” and so on. We are on “the same level,” he said. Somebody ought to find Cardinal Marx a job at a nice little NGO. Cardinal Marx does not seem to understand capitalism or what he is actually proposing. It is all very vague and like his name sake he seems to criticize rather than have constructive solutions. Words like "common good" and "social justice" are nebulous words that have no real concrete meaning. First of all there are many varieties of capitalism. So which model are we supposed to think beyond. We have heard the term crony capitalism and an article nearly 2 years ago by Stacie Beck criticized this form of capitalism which is often called "rent seeking." http://americamagazine.org/issue/just-economics This form of capitalism is far different from free market capitalism where both the buyer and seller willfully enter into a transaction that each feels benefits each party. When one of the two parties is an unwilling participant, then the free model is not operating. One can argue that the only moral way to distribute goods is through this free market model and that any other method unduly favors one person in the transaction over the other. It is truly the provider of freedom to all. Now this is an idealized model but most of our economic advancement is due to free market principles as entrepreneurs are encouraged to innovate and problems get solved and people lead freer, healthier and better lives as a result. Any system will leave some behind and it is essential that this be recognized and provisions are made to the system to provide a safety net for those less fortunate. This is what the Cardinal should be focused on. How to implement free market principles everywhere and how to supplement this system with programs that help those who being left out. We cannot have the "even playing field," "entrepreneurial" form of capitalism you seem to be advocating unless and until the government becomes the strict regulator of the financial industries. What we have now, almost everywhere, is "crony capitalism," and what the Cardinal and the pope are advocating is a MORAL and ETHICAL form of "free market" economics in which individual liberties are protected from too great a concentration of power in the economic sectors. Even Adam Smith was in favour of the regulation of some sectors of the economic system he advocated, by the "Enlightened Despots" of his age. Elements of social democracy based on the Gospels and true entrepreneurial capitalism are not incompatible, so long as neither the Left nor the Right is adamant about ideological purity. Nowadays it is the the "Libertarian Conservatives"--of whom you seem to be one--who are more insistent about ideological purity than socially democratic clerics like the pope and this cardinal. I do not know how you can get that from what I have said. Mises and Hayek pointed out the problems when the free market is interfered with but Hayek wanted a safety net for people. The question is how to do it and then how much. Every way we can think of has a large number of people gaming the system so how to organize it so that as few as possible do misuse the programs. Let me give you an example of one absurdity in the new health care law. It a person makes less than 3 times the poverty level he and his family is entitled to subsides for health care, of about $9,000 a year. If the person makes $50 more he loses the subsides so essentially is taxed $9,000 for an incremental $50 of income. Insurance agents are out there advising people how to make less money so they can qualify for these subsides so they can get their commission on a policy. Also I do not believe the libertarians are the problem. A few make headlines but most would accept a more efficient tax system that was less punitive on individuals as well as innovators. The real problem is on the left which is not taking over industries but restricting them with regulations so that it becomes uneconomical to make a lot of good decisions. What you then get is crony capitalism with much larger industries that work hand and hand with the government and are then eventually much easier to control. Also I am not a big fan of Wall Street and big banks but I don't believe they are the real problem. They make egregious amounts of money which often does not contribute anything to the economy but they are not preventing job creation the way a highly regulated government is doing. Financial institutions are already over-regulated. For example, it was not the lack of regulation of the financial industries that caused the 2008 economic collapse; it was the policies of the Federal Government via HUD and the use of Fannie Mae and Freddie Mac that were the primary drivers. In 1992, Congress enacted Title XIII of the Housing and Community Development Act of 1992 ( the GSE Act), legislation intended to give low- and moderate-income borrowers better access to mortgage credit through Fannie Mae and Freddie Mac. As time unfolded, this effort became such that lending standards were lowered to meet the increased affordable housing goals driven higher and higher each year by HUD, not because of predatory lending. It was really a case of forced predatory borrowing to meet "social justice" goals of affordable housing. Less than 30% of the interest only high risk loans ever ended up on Wall Street. WS only acted as it always did -package debt and sell it. the question is not what WS did, but why there were so many bad loans. Banks collected the fees, and Fannie and Freddie bought them up. Please read Peter Wallison's Minority report assessment. Dodd-Frank punished the wrong institutions because the blame was pre-determined and the commission set up to prove what it had already concluded. Of the nine worst US economic contractions since 1856, none started while Glass-Steagall banking regulation was in effect (1933-1999). I find it interesting that the German Catholic Church has produced both Cardinal Kasper & Cardinal Marx both of whom seem to think that the way to get more people into Church is to eliminate any moral code. Cardinal Kasper, & perhaps many German Bishops, want people who were formerly thought to be "living in sin" (if we are to believe Jesus' words) to be able to receive communion without repenting. Cardinal Marx says the main point of the Gospel is not an "ethical" one but a message of "heaven is open. Free entrance". Now I am not a theologian but I do remember reading that Jesus did talk about the 'ethical' message of, among other things, helping the poor. And while Jesus was very merciful to those with moral lapses, he always included the admonition to "go and sin no more:, i.e. repent. Apparently the German Bishops do believe in "cheap grace". "In identifying a couple of the main challenges in the Western world today, Cardinal Marx said, “We must think beyond capitalism. We have to create a model nearer to the social market economy.”" What were the "main challenges" he identified, & what, if any, concrete proposals did he possibly identify as solutions? Does the Cardinal think that global free trade agreements, of the kind that his nation's government has pursued, are part of the problem, particularly with wage stagnation in developed industrialized nations like the US? Does he think the kinds of "free markets" that have produced the wealth of Silicon Valley, but also provided cheap technologies that have improved the lives of many, including the poor, are useful or harmful? What does he think of his government's role in the Greek Eurozone crisis? "Thinking beyond capitalism" is a pithy slogan; unless I can see specifics, it remains nothing more. I suspect the economists he sits next to at those meetings have bemused look on their faces when he uses that term. It's fun to read the usual folks who post in reaction to a Christian call for economic justice. Same old complaining from them with no engagement with the argument. I won't speak for others, but comment specifically asked for greater detail from the talk. I believe it would be more helpful to analyze & engage in specific criticisms and/or proposals as a means to avoid simply ideological statements that offer little. Like the Cardinal, I would love to see an economic model emerge that guarantees full employment for anyone seeking work at a wage that guarantees a high quality of life, yet that also protects free & fair global trade, so that the marvels of technology are widely disseminated, in an economy humming with innovation that is efficiently regulated by a government that protects the poor & vulnerable, yet that also operates within its means & avoid being held hostage by vested interest groups....I could go on, but the point is: no such system has emerged. So how does the Cardinal propose to get us there? Perhaps the following can help create your model. Since 1961, private sector job growth with a democrat in the White House is nearly twice that of republicans. Since 1947, the increase in median income has overall been over four times better with a Democrat in the White House. I don't view things as purely Democrat vs. Republican. After all, it was Democrats who passed NAFTA (Clinton signed it into law), which, while having many good benefits, is also responsible for the loss of significant manufacturing jobs. Democrats passed (Obama signed) Dodd-Frank - whch has resulted in significantly larger banks, fewer smaller community banks, & bailout authority wholly-free of Congressional oversight. Too big to fail is now enshrined into law. And I seriously doubt that HIllary Clinton can be counted on to pass a financial transaction tax on Wall Street, or significantly raise the capital gains rate, for that matter. Unless, of course, you believe that Goldman Sachs has paid her hundreds of thousands of dollars to give them secret, off the record speeches in an effort to formulate an income inequality plan. Neither party can be absolved or crucified as having all the solutions. I forgot to mention that Pres. Obama's proposal to raise the EITC in his SOTU was a proposal first circulated by a group of conservative policy wonks earlier this year. "Thinking beyond capitalism." Sounds good! What does Cardinal Marx have in mind? Who was it who said: "The devil is in the details?" We must think beyond capitalism. We have to create a model nearer to the social market economy.” This economic model includes strong social protections for vulnerable members of society. The term "social market economy" is a specific term. It is essentially free market capitalism with a social net but with a heavy emphasis on this latter aspect. The question is how big the safety net should be and how to ensure the market is free and the people are free. He also emphasized freedom as well as a specific economic solution. The only free form of economic system is free market capitalism. It is hard not to think Karl Marx when we say Cardinal Marx especially after the cardinal wrote something called Das Kapital a few years ago. Germany is a unique situation and has a unique culture that led to their economic success but it may not be transferable outside of Germany which Cardinal Marx may not understand. He should concentrate on what is transferable from culture to culture. He also doesn't seem to understand what capitalism is about since he is essentially complaining about capitalism while recommending a form of it. Frankly, I think that most of the people writing here who demand a "programme of change" from clerics whose business is only to SUGGEST how to change one's heart in order to make any economic system work, don't understand that the real obstacles to using Christian values to operate in the economic life lie in the FINANCIAL INDUSTRIES, which must be reformed, in order to make what passes for "capitalism" in the modern age become more ethical and more fair. What's being done by banks and hedge funds to business men who'd like to apply "Christian values" to their working lives is MONSTROUS, and the clerics know it. As I said below, I am not fan of Wall Street but don't believe they are the real problem unless you can point to how they are interfering with the free market. The VC's and private equity people have large amounts of money and most of it goes to small startups or inefficient businesses which they want to turn around. @RobertLewis -- how about a specific example of a hedge fund or bank which prevents business men from applying Christian or Judaic values. I think that Mitt Romney's career as a hedge fund operator precisely fits the bill--collapsing firms, moving jobs overseas and forcing dissenting managers in the Midwest to go along with it. All for no other consideration but the "bottom line" and "profits," with absolutely no concern for communities or for "sustainability," and seeking justification for it from business faculties who insist that "that's what capitalists are SUPPOSED to do." The Cardinal has interesting thoughts on living the faith. Reciprocal love with God (responding to His love), sharing the Word in a free and open world, and, working relationships between laity and clergy. The Church of the future. With life's longevity becoming longer and longer, and the need for a work force becoming shorter and shorter, the old work ethics, study harder in-order to get a good job, work for retirement, save for rainy days, work till 65, jobs for everyone, has to change. So many today have two and three jobs, 2 to 4 people in household working to satisfy their needs, just has to change. Currently stats say 30% of the world works long hours (almost to slavery) to support the other 70%. Our world is changing and (especially with the non-linear population growth) and the mentality and customs of the world, both moral and ethical has to alter and change to support the whole of mankind. It is easy to talk, talk is cheap and Cardinal Marx's " “We must think beyond capitalism. We have to create a model nearer to the social market economy.” fails to provide even a clue as to an economic system that provides its citizens a better chance of success than capitalism. Communism,socialism, benevolent dictators, military dictatorships have been tried and failed. Countries such as China who opened its economy gradually to capitalism after 1989 are thriving today while countries such as Venezuela that destroyed its relatively small sector of capitalism is a wreck and its people are suffering. There is an old saying "Shoemaker stick to your last" and that applies to Popes and Cardinals whose "Last " are the souls of the people. He’s not only criticizing this free market economy -- which is not free. So the pope's idea of the term 'free market' is that it is not free. Is it 1984 or Brave New World which defined things as the opposite of what was said. Until the Church hierarchy can get their definitions straight they will not be taken seriously by anyone but a few die hards. My guess is that they have little understanding on how economies work. Cardinal Rodriguez does have some legitimate gripes about the "unfree" free market but it is because it is not free. So he is not objecting to the free market per se, only to when it is not really free and hurts his people. Just as we have the mantra here about how bad certain politicians are because they are exporting jobs. They are essentially saying the poor in other countries can be damned as long as we maintain our good jobs here. Politics is stronger than Christianity for many of us. "The Census Bureau data, previously reported by CNSNews.com, includes beneficiaries of public housing programs, Medicaid, "other cash assistance" programs, and the Women, Infants and Children (WIC) program as well as beneficiaries of TANF, SSI and SNAP. As of the fourth quarter of 2011(latest data available) there were 108,592,000 people living in households in the United States that received benefits from one or more “means-tested” government programs, according to the Census Bureau’s estimate. Those 108,592,000 “means-tested” government benefit recipients, according to the bureau, equaled 35.4 percent of 306,804,000 people in the United States at that time. When recipients of non-means-tested government programs (such as Social Security, Medicare, unemployment, and veterans benefits) were added to those receiving benefits from means-tested programs, the total number receiving benefits in the fourth quarter of 2011 was 151,014,000, according to the Census Bureau. That equaled 49.2 percent of the total population." The USA Is reaching a tipping point where more people are receiving government assistance than are working and paying taxes. Will we eventually become another Greece, Spain or Venezuela, God help us. Does this begin to meet Cardinal Marx's "We must think beyond capitalism. We have to create a model nearer to the social market economy.” ? My inability to imagine the specifics of Cardinal Marx's model that is "beyond capitalism…nearer to the social market economy" is my own limitation. But I agree with him that the world is complex, and that the role of the church is to "enable people with responsible freedom." Nearby is the news that Father Larry Snyder is stepping down as the president of Catholic Charities USA. A visit to the CCUSA website is worthwhile. The organization seeks to reduce poverty in the United States, and is working with local Catholic Charities agencies to promote best practices that actually lift individuals and families out of poverty--giving them real freedom to live productive, satisfying lives. The announcement calling for papers at the 2015 meeting advises speakers to build their presentations around "Moving individuals and families to self-sufficiency", "Using data analytics to measure impact," "Creating transparency and eliminating system failures," Integrating behavioral and physical health services", etc. Many of the local diocesan agencies can show real results from their work. See http://www.ccwny.org/showcase/portfolio. I have trouble conceptualizing the "left position of social justice" but I like what CCUSA and the local agencies are doing to help more people live in freedom in a complex society.